The "Tacita de Plata" is considered the oldest city in the West. Its foundation is due (1100 a.) To the Phoenicians, sailor town that would make Gadir an important commercial colony in which later Carthaginians, Romans, Visigodos and Muslims would settle. A cosmopolitan and open city, Columbus chose his port as a starting point for his second voyage to the New World. The city would become, after the decline of the port of Seville, in port of Indias, agglutinating the mercantile flow with America. This frantic commercial activity resulted in a stage of economic and cultural splendor, in which baroque palaces with their characteristic lookout towers are erected. 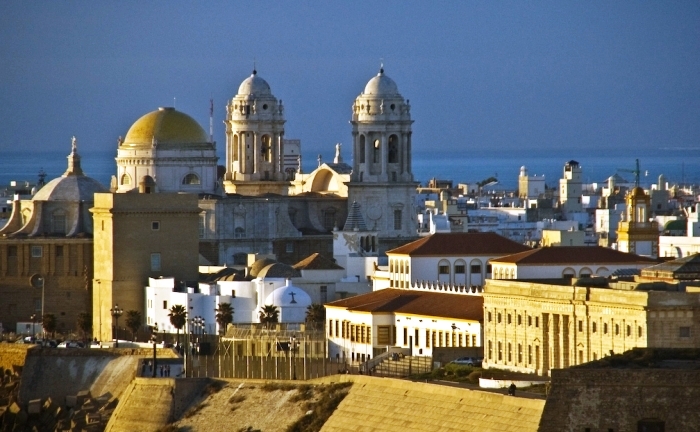 The Cathedral, visible from the sea, especially its dome covered with golden tiles, fits perfectly with the Cadiz physiognomy of colonial airs. It combines baroque and neoclassical styles and its treasure is one of the most important in Spain. The intense commerce with the Indies awoke the greed of the pirates making necessary that the city was fortified. The remains of the primitive but remodeled defense system of crossed fires devised by Vauban form an important part of the patrimonial wealth of Cadiz. The Doors of Earth conserves on both sides canvases of wall and semibaluartes like those of San Roque and Santa Elena. A walk through the Campo del Sur allows you to contemplate the defensive bastions of Los Mártires and Capuchinos, next to La Caleta, escorted by the Castles of San Sebastián and Santa Catalina. In the direction of the Alameda Apodaca, you can admire the Candelaria's Baluarte and the San Carlos Walls. The gates of the Earth Doors clearly separate the new city gained to the sea - structured along a large avenue and its extensive and seafront - of old. The historical center has narrow streets and small squares with neighborhoods as popular as La Viña - the fishermen, Mentidero, Santa María (true seat of flamenco cante) and El Pópulo.